This Diamond pattern solo seat is 9-1/2" wide by 13" long, a perfect fit for that lane-splitter your are building. These seats are USA made start-to-finish in Centerville, Indiana at Sully's Customs. Steel pan and hardware, with black powdercoated finish, 3/4" foam and a high-quality naugahyde cover. Great seat, great price. Lowbrow shipped fast as always. Looks and feels good so far! Awesome seat, great quality. Seat pan can be "tweaked" by hand to better fit your desired contour. 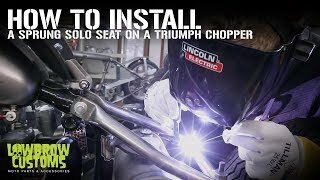 I used as a direct mount instead of spring seat. Really happy with it.